Now that summers will be here and infact afternoons are much warmer, the time is coming back for Beer binging!!! Isn't it? LOL. But yeah, if you also have some awesome food to go with it which is not just a snack but also a wholesome meal, there could be nothing better! But what you really want is something easy and light. I usually make something like this usually when I want to have a non-Indian meal which is not spicy but just simply flavourful and typically English! 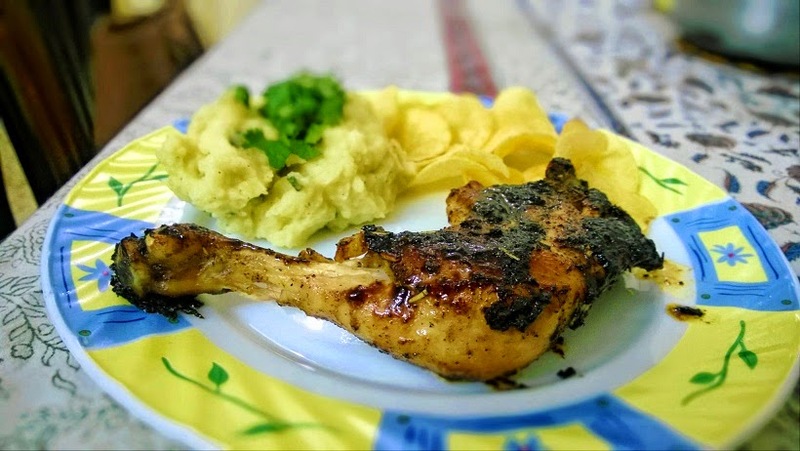 So, it is simply a chicken thigh first pan friend and then cooked a bit in oven served with silky smooth mashed potatoes and Lays chips which can be substituted with fries. Here is the recipe for Pan Fried Chicken Thigh. First, season the chicken thigh with salt, pepper, rosemary, parsley and oregano. Coat it really nicely. Now heat oil in the pan, not too much. Sear the chicken thigh from both sides till it gets a nice colour. Remember, NO COLOR NO FLAVOUR. Now, follow this trick which I do whenever I cook any meat in pan. When oil is hot, add 1-2 cloves of garlic. When you get the colour on chicken, tilt the pan a bit to collect the garlicy oil, braise the chicken from both sides with that oil using a spoon. This adds a lovely garlicy flavour to chicken. Now cook the chicken thigh in preheated oven for 15-20 minutes at 200 degrees C. Take it out and let it rest for 5 minutes. First, put boiled potatoes in a deep flat pan. Add salt and pepper. Now be generous with seasoning as mashed potatoes tend to be bland. Use a potato masher or something like the pav bhaji vendors use to mash the bhaji. Now as you are doing it, keep adding one tablespoon of butter 3-4 times. Also, add little milk but not too much, as you want potatoes to be silky and not runny. These things have to be added while you are using the masher. Do taste it to check the seasoning. If needed, add a little more. Now serve the chicken thigh with mashed potatoes and chips/fries as you see in the pic. I am sure you will thank me for it! Do leave your comments, Like it Or Share it! Leaving your comments here is the best way to engage with my blog. Got feedback or questions? Do leave them in comments. Though they are moderated but be sure that I will definitely get back to you. Thanks.